After I had been working with a particular group of housewives for a year, we started shooting the film Scuola senza fine (literally, ‘School without end’) almost casually, in 1979. I was able to get equipment free of charge and money to pay for the film was made available. The women had taken the ‘150 Hours’ course and had been awarded the completion of secondary school diploma in 1976. But they were reluctant to go back to spending their afternoons ironing or playing cards. So first we devised new seminars on literature, the body and the image. Rediscovering the pleasure of reading and studying was like reliving their adolescence. It was important for them to have a teacher to whom they could tell in writing what they had done and thought, their past history and plans for the future. 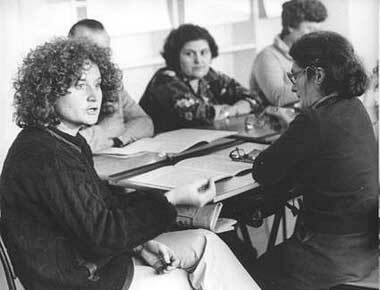 The teacher of the diploma course was someone who listened to them and made them think: Lea Melandri, who came from the Women’s Movement where she was considered a fine theorist and had been a promoter firstly of the “Gruppo dell’inconscio” (see p.7) and then of the “Sexuality and Writing group”. She was consequently familiar with issues related to the unconscious, to women’s relationships with each other, and to the individual’s relationship with culture and knowledge. She was able to strengthen the women’s expressive potential and transformed the adult education course into a study and research group which was later joined by more teachers and new students. Watching the project develop was like uncorking a champagne bottle. The women’s writing matured and began to flow and sparkle while Lea, whose book L’infamia originaria was about to be published, did not write anything else for several years. The women students, encouraged first by Lea and the discovery of Freud, then by the other teachers and by science, philosophy, and linguistic analysis (visual, written, and body languages), filled page after page of their writing pads and exercise books ( or in Amalia’s case, loose sheets), with personal reflections on culture, themselves, their families, nature, and feelings. The group changed in the course of time and in 1981 it became a graphics cooperative. In the early years, and during the shooting of the film (1979-81), it was important for the women to be able to socialise without the usual local prejudices. Lunches, dinners, dances, parties, and going to discos were the most frequent forms of entertainment. The film shows how the women related to each other at that time and the special closeness each woman felt for every other – perhaps because they carne from the same place, or shared the same ideals and way of thinking, or, simply, because they were fond of each other. For many women, rediscovering the mother-teacher relationship meant being able to express thoughts which had often been undervalued or disregarded (most of the housewives attending the course had given up their education to go to work or had not been able to make use of the knowledge they had already, because they stayed at home after getting married). The opportunity to relive that relationship in a learning situation stimulated a very interesting kind of writing and thought. At first, the women’s unfailing ability to get to the heart of philosophical and scientific issues used to take us by surprise. Their writing shows an independent way of thinking which is not dazzled by long words or intimidated by theory; they used to play with theories or use them as magic formulas, but always to approach a question to which there was no answer. This approach o culture caused a number of difficulties but this is not what the film is about. The task of tracing that part of the story can be left to subsequent writing and other documents. The film merely records the initial part of the work and recreates its atmosphere. The social occasions indicate how individuals related to the group, while individual pieces of writing show us how thinking develops and unfolds at a kitchen table in the middle of the night, on a stage, or facing a blank drawing sheet, while dancing, or looking at window-box plants that evoke the countryside, or walking home. Every now and then, during those three years, I used to take the camera and film. Then I gave it all up and did not touch the material for two years. The shooting of the first part of the film was undertaken collectively. But then everybody lost interest in it. I decided to finish it on my own and this is how the second part, the individual chapters, took shape. I found it painful to contain in language the intense experience of our lives together but I had to convey it as best as I could. This is what I said to myself every time I shut myself away to edit. But working on the film was like operating on a hypothetical, complex, and multifaceted maternal body for which I had to find a shape, especially in the second part of the film where I had to look directly at each woman in turn. I used editing the film in my free evenings as an alibi to hold my anxieties and anguish at bay. At last, in February 1983, the final copy was printed. Made with the collaboration of: Lea Melandri, Amalia Molinelli, Ada Flaminio, Antonia Daddato, Teresa Paset, Rina Aprile, Micci Toniolo, Paola Mattioli, Maria Martinotti. *In Giuliana Bruno & Maria Nadotti (edited by), Off Screen: Women & Film in Italy, Routledge, London and New York 1988, pp. 80-2.